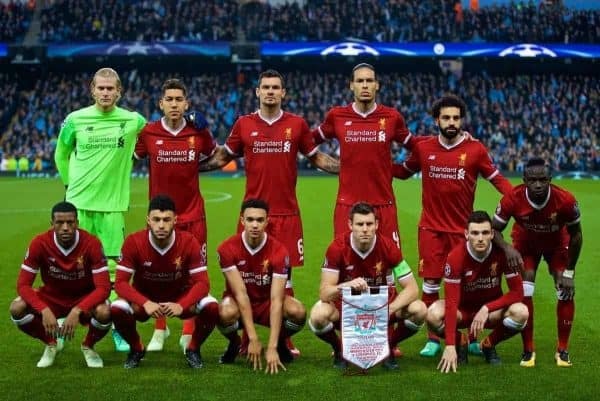 Jurgen Klopp has made five changes to his Liverpool lineup for Tuesday night’s crucial Champions League quarter-final second leg at Man City. The Reds arrived at the Etihad holding a comfortable three-goal lead as they bid for a place in the final four, but will be aware of the test ahead. While scoring once would require City to net five times to progress, the 5-0 defeat in Manchester back in September will be a stark reminder of the champions-elect’s quality. After making five alterations to his side from the first leg for Saturday’s stalemate in the Merseyside derby at Everton, Klopp has reverted to a stronger side in Europe. Loris Karius keeps his place in goal, looking to maintain the form that has helped him keep the most clean sheets of any ‘keeper in the Champions League this season. Ahead of the German are Trent Alexander-Arnold, Dejan Lovren, Virgil van Dijk and Andrew Robertson, with the latter recovering from a calf problem to return. In midfield, Jordan Henderson‘s suspension and Emre Can‘s season-ending injury requires Georginio Wijnaldum to slot in as Klopp’s No. 6. With few options elsewhere, the manager has named James Milner and Alex Oxlade-Chamberlain alongside the Dutchman, to form a strong trio. And with Mohamed Salah also making his comeback after missing out on the derby, he joins Sadio Mane and Roberto Firmino in attack to fire Liverpool to the semi-finals. 📲 Follow the match live on the This Is Anfield app for iPhone and Android. There'll also be reaction, analysis and videos after full-time. Click here to get it for free.